For those of you who don’t know me, my name is Te Ara and I have a 18 month old daughter named Mila. Isn’t funny how we do that? We always talk about our children. As parents our children will be the most talked about person/subject in our lives. How many parents out there answer the simple question “how are you? – with – “Good, Mila ate all her dinner last night, oh and she finally cut those back molars, so yeah I’m great”. Those who aren’t parents may get bored of my constant whining about Mila’s inability to sleep through the night, the lack of sleep, the runny noses, coughs, and the fact that I can so openly talk about a little humans bowel movements. But here at Karanga Mai it’s all in a days work. I am so lucky to be a part of a community who not only share in mine and Mila’s downfalls but also our triumphs. We all have our back stories that lead us to where we are today. The beginning of 2015 saw me as a student leader, captain of the College A Netball, and Senior Mixed touch teams, taking both codes to compete at nationals. After my home life falling apart, leading me into a downward spiral of anxiety and depression, the end of 2015 saw me dropping out of school a month before finishing, 20 credits short of NCEA Level 3, running away from home, with no qualifications, no job and landing myself in an abusive relationship. A few months later, shortly after my 18th birthday I found out I was pregnant. My maternal instincts kicked in and I left my abusive relationship for the sake of the baby, and made my first venture to Christchurch, running to my big sister. Another couple of months passed and it became evident that I was having a miscarriage, sending me further into my spiral of depression and at this stage I thought ‘this was it’. I had nothing left to lose so I moved back to my home town and begun my relationship with drugs and alcohol. July 2016 was when I met Mila’s Dad and he pulled me from the dark hole I was in. August that year I found out I was pregnant. This pregnancy made me truly believe in the saying “everything happens for a reason”. We didn’t tell anyone about the pregnancy, and I got a job at BP and worked throughout. With the impending arrival of our little girl I finally found my motivation and want to do better. Mila saved me. After the realisation that I wanted more, for not only my life, but Mila’s, I made my second venture to Christchurch, this time with a 7 month old baby, and a whole new outlook on life. My second chance at education came about when I came across a brochure for Karanga Mai Young Parents College. I decided to email the director Rachel, after which she gave me a time to come in and look around the school. I knew from that moment on that I had finally found a place where we belonged. 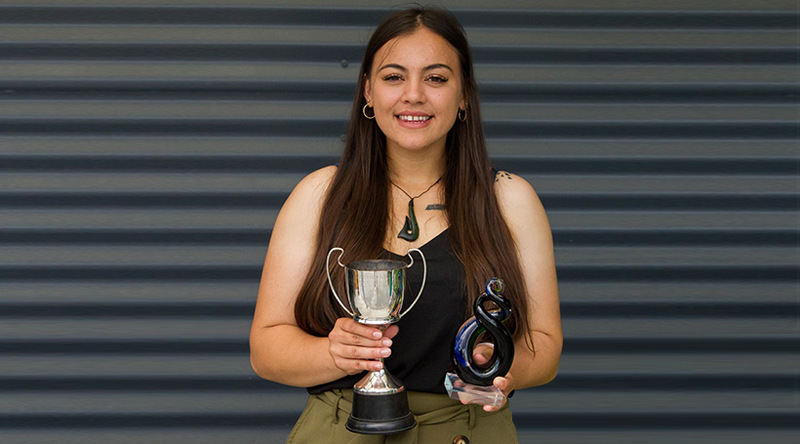 With the help and support of the teachers and staff I not only gained NCEA credits but also gained confidence in being a parent whilst learning quality life skills along the way. My journey through Karanga Mai hasn’t always been smooth sailing. There’s been times when I’ve wanted to give up, and there’s been times when I have given up. But there has always been someone there to pick me back up again. This year was filled with a lot of tears, but even more moments of achievement, fun and laughter. I leave this year having completed NCEA Level 3, gaining my full license and learning how to communicate with people again. Without knowing it, every single person within the Karanga Mai community has lead me to become a better person. Being at Karanga Mai has opened my eyes to a world of further education, and made me believe that I am able to achieve anything I set out to do. Karanga Mai has taught me the value in being a mother, and just how precious our time is with our children. With this knowledge, I plan to enrol in Nursing at Ara for semester two of next year, and for the first half enjoy spending time and making memories with Mila in her first years. To all the students – look how far we have all come in the short space of a year. I know each and every one of you will go on to do great things, and you all should be so proud for doing this, for not only your future, but your child’s future. After getting to know the students, it’s safe to say our babies will forever be our greatest motivation and proudest accomplishment. Completing my secondary schooling has been made a whole lot easier, doing it alongside all of you wahine toa. To all of the ELC staff, I thank every single one of you for looking after Mila as if she was one of your own. You all have given Mila a safe space to learn, to grow and to trust. I will forever be grateful for getting the opportunity to have you all share in Mila’s first years and will never forget everything you have done for the both of us. To Rachel, Jayne, Christine, Wendy, Brigid, Carola and Kerri words cannot express how privileged I feel to have all of you guiding me along this journey. I have never felt short of a helping hand and I have never felt so supported to follow and achieve my dreams not only academically but also as a parent.